If you are going to drive in a country outside the EU you usually need an International Driving License (IKK). There are two different versions of cards, and some countries only approve one, therefore we need to know which country you are going to drive in. Within the EU, your regular driving license is sufficient, provided that it is of the new EU model. Take a copy of your driver’s license, both front and back. NOTE! The copy on the driving license must be a maximum of two weeks old and certified (witnessed) by two persons with telephone number . Some of our agents can help you take the photo and print it, against a surcharge. 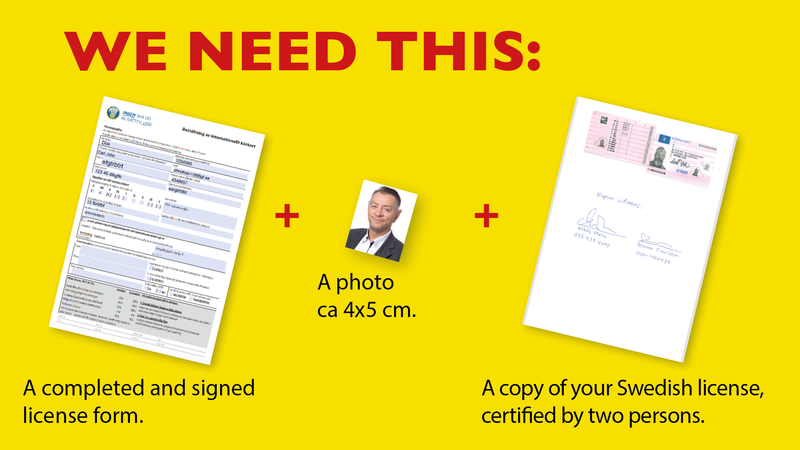 Submit your order (filled in form, photo and driving license copy) to one of our agents. Most agents accept the application by e-mail. You can choose to send to any agent. Here is a list of the agents. Done! Your order will be shipped within ten working days of receiving your application. See below for orders that are in a hurry. One-year, or three-year? Which license applies in the country you are going to go to? You pay when you pick up your driving license at the post or at your postal agent. Since it is a value document, we always send it with a cash advance. If you pick up your driving license yourself, you pay on the spot. Some of our representatives can only handle cash payment. Some take Swish. Check in advance so you have the right payment with you when you pick up. Here is a price list. If you are in a hurry, some of our agents may offer Express or IL-Express. That is the fast lane. NOTE, all agents cannot offer express services . Always check with your agent in advance.